I am so totally with you! I hate stinkum things. No scents in the air, in my clothes, on my body or in any product I use. If my house gets an odor, I air it out. A big reason I don’t wear make-up is because the smell made me sneeze. Back when I was dating, the first thing I would do is get the guy to STOP wearing cologne and/or after shave. Before the advent of Bath and Body Works and similar soap selling stores [think mid 80’s] I worked at Crabtree and Evelyn. Talk about a smell. Holy boar’s hair brush Batman [yes, we sold those too – $80.00] that place would nauseate you. I got used to it because I needed a job while in college, but I never [and still don’t] understand the allure of the $5.00 bar of soap. But my Mom always said it beat the heck out of smelling like a Big Mac at the end of my work day [my HS job] So, yeah, one bonus. Do you think Wal-Mart has those pinecones near the entrance to mask the odor of the clientele? Have you seen those E-mails lately of the candid photos of some of the shoppers? 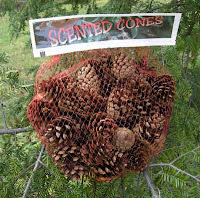 If they smelled half as bad as how ridiculous they looked, you’d need more than Cinnamon Pinecones to hide that odor! Tom, I think I would prefer trailer trash BO over cinnamon pinecones. Didn’t I make that clear??? Ellen, I hate men’s cologne, too. And Skip, $80 for a hairbrush. The Fuller Brush man must be wetting himself. It started with a phone call from Beth, our real estate agent that lists our (my companies) homes in Davidson. I held my breath to hear if we had an offer over the weekend. She reported slow traffic as usual and one agent commented that one of the houses smelled like smoke. We laughed. Beth told her that she must be thinking of another house. After all, the listed house has never been occupied. The house in question is a 3,500 sq ft beauty with hardwoods, stainless, granite and even two master suites. Trouble is, we have had it on the market for two years. We have lowered the price, had open houses, planted flowers and even staged it with antiques and expensive looking furniture (from consignment shops). Nevertheless, I decided to check it out, knowing full well that this beautiful house didn’t smell. I unlocked the door and stepped in. It smelled stale, almost like smoke but not quite. It wasn’t smokey like someone had been smoking in the house, nor was it smokey like something smoldering. No, it was more like the high school teachers lounge after it had sat vacant over the summer. Then it struck me. The antique dining room table and chairs had apparently been cooped up inside a family estate where everyone smoked around it for 70 years. I threw open the windows convinced that the house just needed some air circulting. I left the house open and took off for Lowe’s where I needed to buy the pansies that would replace the sorry looking impatience. As I pushed my cart back to the garden section, I was accosted by the smell of cinnamon coming from the Christmas department. There they were, a full bin of freshly unpacked bundles of pinecones that were overwhelming and yes, overpowering. What better to mask the odor of stale smoke? So I threw a bundle into my cart. Back at the house I dumped them into an antique looking crock and placed them by the front door. So please was I that I cleverly solved the problem for $5.49. Two days later I came back to check up on the house. I opened the door expecting to be greeted by the sweet smell of overpowering pinecones. Instead, it smelled vaguely of cinnamon and stale smoke. I should have learned my lesson as a child. Growing up in Ohio with two parents that smoked, I knew that all fabric absorbs that smell. I must have spent my childhood wearing clothes that reeked like the antique dining room chairs. Not fabreeze, not glade, not potpourri, not even cinnamon pinecones will make that smell leave. So now you know who buys those pinecones. If you want to view the house, visit http://www.jcburban.com Fortunately, it looks better than it smells. I agree. These pinecones are sickening. I think we ought to start an email petition and send it around the world and back to Wal-Mart…It would be fun to see how many people REALLY DO hate these as I hear it in conversation all the time: I get a headache, they make me sneeze, dizzy, and even “I can’t breathe when I’m around them”…etc.etc. Plus, how incredibly arrogant is it of ANYONE to assume that just because THEY want to smell something–the rest of the world has to smell it along with them? Amen to the pinecone haters! I think they ought to just be placed in the garbage where they belong in the first place. What a waste of otherwise fine pinecones. They ought to do a documentary on the poor people who have to work in the factory that produces these rotten things. I imagine they have new employees every season, because you could probably only work at this factory for one day or one week before you were dead! Why aren’t any journalists looking into this story: Discount stores with nothing but disregard for persons who become ill from smelling these, (making them openly noncompliant with Americans with Disabilities legislation) and the factory workers who are putting their lives on the line to produce these (in India?) who are just trying to feed their families. If open public smoking became the norm in these stores, you would have people howling everywhere, yet they are free to assault (yes, assault) anyone they like with these horrible things. How arrogant of anyone to suggest that if you are in a wheelchair you can shop at Wal-Mart, etc. but if you have allergies to these pinecones you are not “allowed” to shop at that store unless you have a death wish. Also–to all of the realtors out there who think they are giving such wonderful advice to place air fresheners or scented pine cones or some such other toxin in an otherwise fine home in the attempts to produce a sale: really, what you are doing is LIMITING or REDUCING your pool of buyers to persons without allergies, asthma, etc. etc. I have disappointedly turned down making an offer on many fine homes because of this exact reason. The first thought going through the head of a buyer that gets attacked by fragrance at the front door is: why is this house so fragranced? I wonder if I can ever get this smell out? Or, I hate that smell (even amongst fragrance lovers). What are they trying to hide? Hmm, lets keep looking… Better tips for selling would be: bake some bread or cookies prior to showings, get rid of ANYTHING fragranced, and the standard of no smoke or anything offensive (maybe wash down the offending furniture with something fragrance free or NATURAL mint or lemon, Diane, or sprinkle upholstered items with baking soda then let sit before vacuuming–or just get rid of that item before showing). I am looking for a place to lodge a worldwide ban on the smell of fake cinnamon. I just had to leave Krogers, totally nauseated b/c they are INFUSING it through the air system!! At first I thought it was just in an area, so I zipped past the flower section, etc. but could nto escape…then realized even in the freezer section, the odor was PERVASIVE. Chemotherapy patients , former chemo patients, lung patients, and those of us who simply associate bad memories with the smell of cinnamon really cannot tolerate the smell. Who associated the season with this trashy odor? I sent a looong letter to Krogers but would like to initiate a huge letter writing campaign as I think there are probably a gabillion people who do not want to inhale carcinogens…(yes, there are studies that show this crap is detrimental!!). Any ideas how to stand up for our rights to clean air at christmas?? Karen, I think the unfortunate part about all of the toxic substances we are being subjected to (such as these horrid fragrances, and rampant pesticide and herbicide usage) is that the use of these substances is mainly by those with limited or no education in the areas of health or information about substances that can create or dis-create a state of health. And the sheer numbers of those uneducated persons is a staggering one. I will unfortunately open that up to even those is the health profession –such as doctors or dentists or staff that load up on cologne as part of their morning routine, or place air fresheners in their offices–totally oblivious to the fact that they are serving a diverse population, and that many are bothered or even made ill by these products. You also have the problem of “marketers” who in their state of ignorance about health issues, are never-the-less continually seeking ways to entice you to buy, buy, buy and they have somehow latched onto the falsehood that Christmas + cinnamon = buyers. So again, education of this group would be helpful. The problem with the education process on this topic in general is that this society (as of this date on the calendar) is unfortunately only up to the level of societies’ knowledge of the hazards of cigarette smoking in 1950. The cancer industry is also so intensely focused on a cure–when more dollars should be spent on prevention. It never ceases to amaze me that groups of well-meaning people will don pink ribbons and take sponsored “cancer walks” in freshly sprayed parks. Education. I did have some success with Wal-Mart recently regarding the pinecones (and I do express my thanks to the manager of that particular store) –by addressing this as an accessibility issue. They ended up placing them back in the separate home and garden area –so no, I still cannot shop in that part of the store, but it was a start and I can now at least shop in the main store, and it is at least some progress in the right direction. All businesses and places of public access are supposed to be handicapped accessible. If you create an atmosphere in a store which does not allow everyone in the public to use or access that facility (such as those with the medical conditions you mentioned, or asthmatics or those with fragrance allergies or Multiple Chemical Sensitivities, etc) then you have really created a situation where that business is openly non-compliant with Americans with Disabilities legislation. And in this litigious society, most (decent) businesses will take corrective action rather than risk facing litigation–or the unpopular appearances associated with discriminating against the disabled. Came across this blog entry by chance, and had to comment. I have a friend who is deadly allergic to those stupid pinecones–one sniff will send her into anaphylactic shock! She almost had to go to the ER once after we went to the grocery store together (we were roommates at the time) and those things were EVERYWHERE. I don’t get them, either. They have SUCH a strong smell, especially in those giant bins! I am so glad to see your comment…I went into Walmart last week and after walking by those stupid pinecones I couldn’t breathe…anaphylactic shock!!! I am still coughing like a smoker a week later…oh joy for the holiday season. I guess I’ll really be shopping online this year. My roommates buy these pine cones. I found this blog when I googled how long the smell would last for. Ideas on how to get rid of the smell without getting rid of the actual pinecones (my roommates love them!)? If Fabreese doesn’t bother you I’d try that. I don’t have any decent suggestions. I’ve never noticed the cinnamon pine cones at our Walmart before this year. I ran past them and purchased an electric blanket. When I got home, the blanket had a cinnamon smell, so I washed it. Guess what- the blanket still smelled (or should I say reeked?) of cinnamon, plus my washer and dryer and the whole cellar did too. I threw some old clothes in the washer and dried them. Repeat twice. Washer, drier, and cellar still cinnamony. Anyone have any advice on how to clean the cinnamon residue out of a washer and dryer? Who knew there were this many people with a problem with cinnamon. Everyone else I know loves it! Nice to know we’re not alone. I just had to comment about these Pine cones from HELL! I did actually buy a bag from Krogers a few days back because I have an old apartment that smells like an old closet. Plus I love the smell of cinnamon. HOWEVER, upon bringing them home and putting them out in dishes, I started to have allergy symptoms and felt quite poorly. I googled allergies and cinnamon pine cones and sure enough came across an article that suggested there is a link, not only because of the strong scent but if the pine cones are real, they can be holding mold. (Which I’m terribly allergic to) I have since moved the offending pine cones to the trunk of my car in hopes to find someone to pawn them off on. As for people who are trying to get rid of odors, place decorative bowls of baking soda around the area that seems to be holding odors. I know baking soda in a dish really doesnt look that great, but hey, it works! Those pinecones are placed strategically because a lot of research says that when people smell cinnamon they tend to spend money or buy more. It doesn’t work on me unless it’s from cinnamon rolls that have real edible cinnamon which smell way better than those damn pine cones. According to the florist at my local grocer, they pine cones can’t be put in plastic because they will rot. I’m not sure if this is true. I was told they can’t put them in bags because they would rot. I don’t think that’s true though. I saw a video on how they where made which involved drying them in the oven which also makes them open up a little, and sealing them in a plastic bag after being treated with the cinnamon oil. I used to work at a supermarket don’t remember if you want done and laundry detergent aisle you could still smell the soap but because it was sealed it wasn’t as noticeable. I had one manager that didn’t like the smell of dog food bags, I prefer that snow over the scented pine cones. OMG!! I thought it was just me! I get so sick from the smell of these & those stupid cinnamon brooms! I avoid stores like the plague. I’ve asked in a few stores about moving them to a specific area (so I can try to avoid) or putting the bins outside. I have been told more than once that this is a “seasonal scent” & stores feel that this indeed puts customers in the mood to shop. Ick.